The Flag of Kooki has equal yellow stripe (top) and white stripe (lower part) horizontal stripes. The emblem is placed half over the yellow & half over the white stripes. The Royal Flag is similar except it has a golden "Kooki" frill, see illustrations below. His Highness (officially recognised by the Ugandan Government) Apollo Sansa Kabumbuli II. The Kamuswaga of Kooki, and his kingdom is officially named are recognised as OBWAKAMUSWAGA wa KOOKI (under THE INSTITUTION OF TRADITIONAL OR CULTURAL LEADERS BILL, 2010 (signed into law on 07 December 2010) and this Act No.24 is to operationalise article 246 of the Uganda Constitution, 1993, locally called "The Kings Act". The Consort of the Kamuswaga is The Omugo (Queen, usually also addressed as Lady), Rebecca Tulituuka (married Jan. 2011), she is from Busoga. 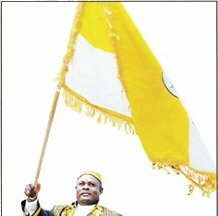 "The Kamuswaga, Apollo Sansa Kabumbuli II, the head of the Kooki chiefdom, has introduced a flag and anthem for the county amid fears that it might break away from Buganda Kingdom. During a function held at Dwaniro sub-county headquarters, Kooki premier Ananiya Sekyanzi, however, said the country will remain under the Mengo leadership. Introducing the flag and anthem does not mean we are breaking away from Buganda kingdom,” he said. He said the symbols were for identification purposes". The photo attached to the article shows only partially the flag, which seems to be horizontally divided yellow-white with an emblem in the middle and a golden fringe with tassels. All modern sources lists Kooki as a Chiefdom and not a Kingdom. While I am not familiar with the traditional organization of African states, I understand that a Chiefdom is part of a Kingdom, the Chief being some kind of "vassal" - provided this European medieval concept can be transferred to Africa - of a King. The article presenting the Kooki flag clearly stated that several in the Kingdom of Buganda feared that the adoption of a flag by the Chiefdom of Kooki would be the first step to secession, which I understand as the re-establishment of Kooki as an independent kingdom. Kooki Kingdom the colours are black & yellow (or gold). Photographs of H.R.H. 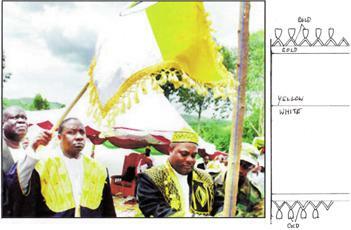 The Kamuswaga (King) Kabumbuli II show his newly designed flag with the Arms are placed in the usual white disc on the flag (yellow over white - the white seems to be 1.5 times wider than the yellow). The King's Standard is surrounded by a gold fringe.